About a month ago, I was asked to join my friends on a journey to Kyoto in Japan and, although I knew nothing about the city, I said yes. Being a student, I had no big plans for my spring break, so when the opportunity presented itself, I knew that it would be the opportunity of a lifetime. And now here I am, sitting in Kansai airport. It is 00:15 and the plane heading back to Europe won´t depart for another 10 hours. We´re sleeping in the airport to save money and time finding a hotel, which leaves me a moment to reflect on my first meeting with Asia, and particularly Japan. The first thought that came to mind after having spent nine days in Kyoto was the fact that it is a city of very fundamental contrasts. Kyoto is in all respects a modern city. This was made evident by downtown Kyoto’s freakishly straight streets, as well as the names given to a number of major roads. The transportation system is very well developed and always on time, making it the perfect way to travel between sights in Kyoto. It is also different from in the UK. In Kyoto, one enters at the back of the bus and exits at the front, and it is at the front of the bus where you pay 230 yen for the ride. This back to front system can make for some funny, and slightly frustrating, situations while trying to make your way through a fully packed bus within a few seconds. For the tourist, the cheaper option would be to acquire a daily bus pass, for which you pay 500 yen. These can be bought in hostels, hotels and convenience stores. These are definitely worth the money if one takes more than two buses a day, which is more than likely to be the case as there can be quite a long distance between the various sights. Besides, learning to navigate the bus map of Kyoto will save you a lot of time and sore feet. There are a number of shopping centres, among them Yodobashi Camera, where one can find everything from famous brands like Nikon, Canon, Sony and Toshiba, to clothes, sports equipment and a large selection of restaurants. This shopping centre is located right outside Kyoto Station. However, a good starting point for the best Kyoto shopping experience would be the station itself. Surprisingly, there are three large shopping centres located beneath the railway station: Porta Underground Shopping Mall, The Cube and the department store, Isetan. Porta has an exceptional range of restaurants, where you can easily get good meals for less than 1000 yen, as well as a large selection of clothes shops, many of which help dress the stylish Japanese population. The shops offer good quality clothes for a decent price and, although a price tag of 5000 yen might put some people off, one has to keep in mind that it is actually no more than £35, which is reasonable for a nice dress. In The Cube, there is some more fashion, but they also sell confectionery and souvenirs. Finally, there is the Isetan department store which spans over thirteen floors - a big bulk of it is dedicated to fashion and branded goods, but one can find anything here from sports equipment and interior goods to stationery. There is also the Shijō-dōri and the Teramachi and Shinkyogoku shopping arcades. Most people do not go to Japan to shop, however. Rather, they come to experience the culture and the local cuisine. As a Norwegian with very little taste for seafood, this trip has been quite an experience, as the Japanese diet is very heavy on ‘the cuisine of the sea’, with shrimp, crab and fish part of most meals. On the first morning at our guesthouse, we were served a Japanese breakfast consisting of fish, miso soup, seaweed, a bowl of rice and pickled vegetables, all of which would be considered a full dinner if it had been served in the West. Nishiki Market (or the ‘Kitchen of Kyoto’) in downtown Kyoto is a food market of epic proportions. Stalls upon stalls cover the street, which stretches into the distance and runs parallel to the bigger Shijō-dōri. The air is heavy with the smell of fish and spices, and there are merchants who cry their wares to attract the attention of potential customers. 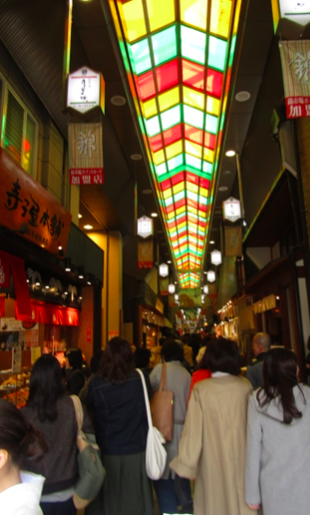 Under the colourful vaulted ceiling of the market, it is easy to lose yourself while tasting a variety of different Japanese foods, smelling tea leaves and watching fellow tourists and locals shuffle along in an attempt to get to the stalls. It is truly an experience not worth missing out on! What is Kyoto without a cup of tea? It is the home to 1.5 million people, geisha (more commonly known as maiko and geiko by the locals) and, most importantly, the tea ceremony. The focus of these ceremonies is the matcha tea, a green powder mixed in boiling water which turns into a bright green, creamy liquid. Tea ceremonies are simply a way of welcoming a guest with tea, but it has become ritualised to an unimaginable degree over the last 500 years, and both the host and the guest have to conform to a strict set of rules. For those who can enjoy this Japanese tradition, prices normally start at 2000 yen per person, but this price can easily become more expensive if one requests a private session. For those who would rather prepare their own cup of tea (grounding matcha and making the sweets), there are alternative experiences which are slightly cheaper, starting at 1500 yen. Tradition is important here. Its two thousand religious centres (of which 1600 are Buddhist temples and 400 are Shinto shrines) form safe havens from the urban world, and seem to transport you right back to pre-industrial Japan. Once inside, you forget about the troubles of your life, the noise from traffic outside fades away, and you forget that right beyond the gates there is a highly urbanised community. You experience a feeling of calm while wandering along the grounds of Eikandō, studying the architecture of these magnificent buildings, and visiting their grand halls and tranquil gardens. Yet, there was also an excitement in squeezing through the crowds in order to capture the perfect shot of the gold leaf temple of Kinkaku-ji, one of Japan´s most popular buildings. A funny memory I made on the trip was while I was at the flea market in the Tō-ji temple after being caught outside in the pouring rain. I got so thoroughly soaked that one of the merchants must have pitied me because he offered me a towel to dry myself with! If you have time, the Fushimi Inari-taisha is one of the most stunning temples in the area, and is no more than a short train ride away from the city centre. Sitting at the base of the mountain Inari, there are trails of orange torii (commonly found at entrances to Shinto shrines) that lead all the way up to the top of the mountain, as well as trails to many smaller shrines on the way. Kyoto is one of the best preserved cities in the country, not simply due to its two thousand religious centres, but because it is brimming with ancient palaces, gardens and architecture. The city can boast that it was the imperial capital of Japan for over a thousand years until the 19th century when it was moved from Kyoto to Tokyo by the emperor Meiji in 1889. The imperial palace is worth a visit, as is the Nijō Castle. Walking through the blooming gardens of Nijō must have been one of the most magical experiences of my life. I strolled beneath the pink and white plum blossoms, their flowers filling what seemed like every inch of their branches. 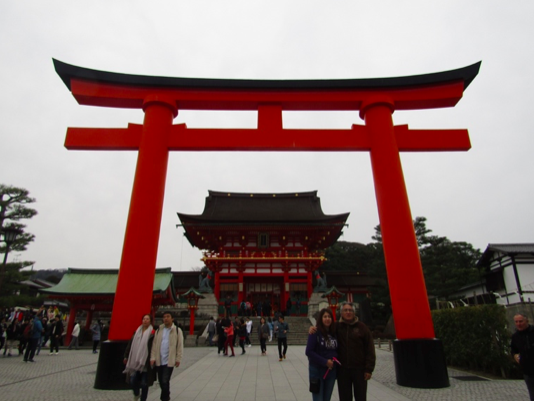 Overall, then, my opinion is that whether you like history and temples, food or shopping, or a combination of all these things, Kyoto is the city for you!